Omega-3 pure vegetable from algae oil. 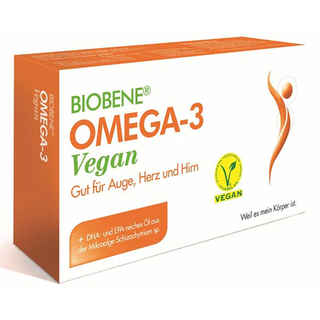 Biobene® Omega-3 vegan contains a specially designed fatty acid combination EPA + DHA. Omega-3 fatty acids are healthy, polyunsaturated fatty acids. They are essential substances and can not be produced by the body. In particular eicosapentaenoic acid (EPA) and docosahexaenoic acid (DHA) are essential to life, which occur in algae, small marine crustaceans and especially in fish. Marine Omega-3 more and more disappears from our diet. Vegetable Omega3 (alpha linolenic acid) can be cast only in traces in EPA and DHA and thus far do not cover our Omega-3 needs. Therefore we must supply of EPA and DHA. 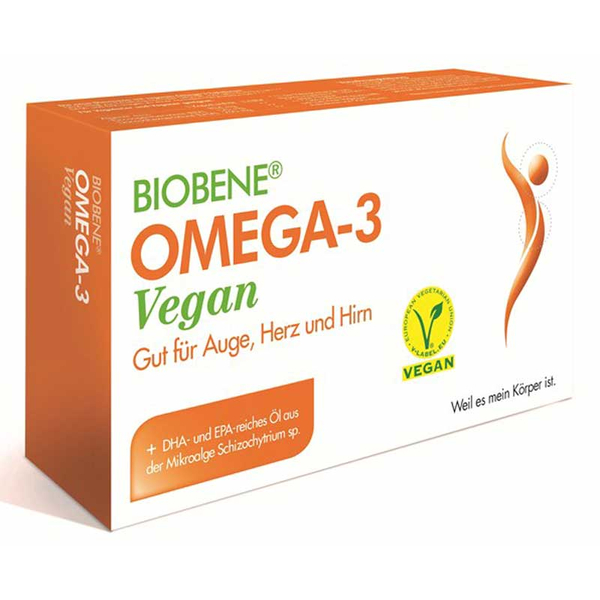 The special Biobene® Omega-3 Vegan is the extraction of DHA and EPA from algae oil, the vegan alternative to fish or krill oil! This is especially important because vegetarians eat little fish or completely abstain from fish or do not take the daily allowance of 200-300mg essential fatty acids EPA and DHA. Biobene® Omega-3 Vegan is free of additives such as sugar, lactose, fructose, gluten, iodine, milk, yeast, preservatives and dyes. Consume 1 capsule daily as a dietary supplement with a glass of water to or after an oily meal over a period of at least 3 months. 834mg algae oil including 125 mg eicosapentaenoic acid (EPA) and 250mg docosahexaenoic acid (DHA).